Marketed by the UK Atlas Agents the "Acorn Machine Tool Company 1936 Ltd." of 610 - 614 Chiswick High Road, London W.4, the British Halifax Model "524" 5-inch centre height by 24 inches between-centres lathe of the late 1940s and early 1950s was very recognisably based on the American Atlas "10-inch". Sold originally with a Halifax badge it was renamed, probably in 1951, as the "Acorntools" to match the name already given by the company to their capstan version of the Atlas 10-inch. 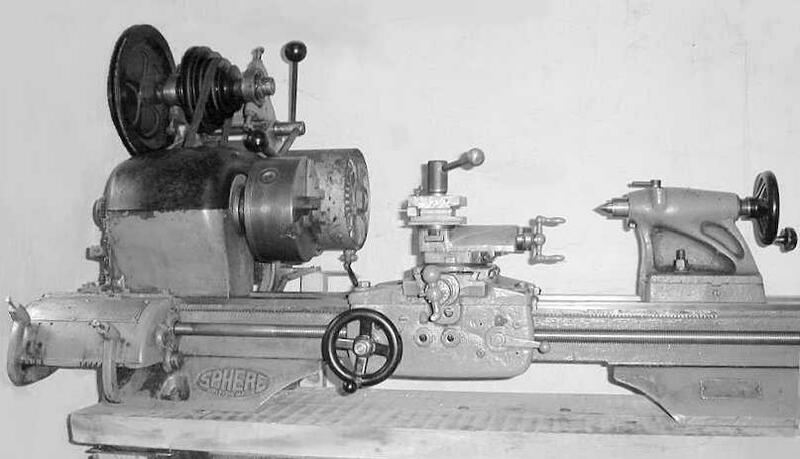 Like the similar "Sphere" model it was, in both Halifax and Acorntools guises, essentially identical to the original American machine and, allowing for the 1450 rpm English motor rather than the 1725 rpm American one, had the same speed range; both the countershaft unit and the headstock were of the Atlas 10F "vertical" type but with, on many examples, the changewheel and headstock-belt covers manufactured in engineering plastic. However, a number of machines have been found with covers in cast aluminium, though if these are earlier or later examples is not known. Another bold feature was the early use of the same plastic for the headstock and countershaft pulleys; this appears to have been an entirely successful idea for the author remembers examining, some years ago, a completely worm out Halifax where the pulleys were still in perfectly serviceable condition - although had a heavy object dropped on them no doubt they would have been less far less able to shrug it off than ones in cast-iron, aluminium or ZAMAK. Details of where and how the Halifax/Acorntools was constructed are lost in time but there is one small clue in a 1956 letter from Acorn to a Midlands distributor where they refer to an Atlas parts lists as containing: "….all spares which go into the manufacture of a Halifax Lathe". This statement would appear to lend some strength to the proposition that Halifax (and possibly Sphere) lathes were built from a mixture of UK-sourced parts and genuine Atlas spares; however, whether these parts were from existing stocks or specially imported is unresolved. 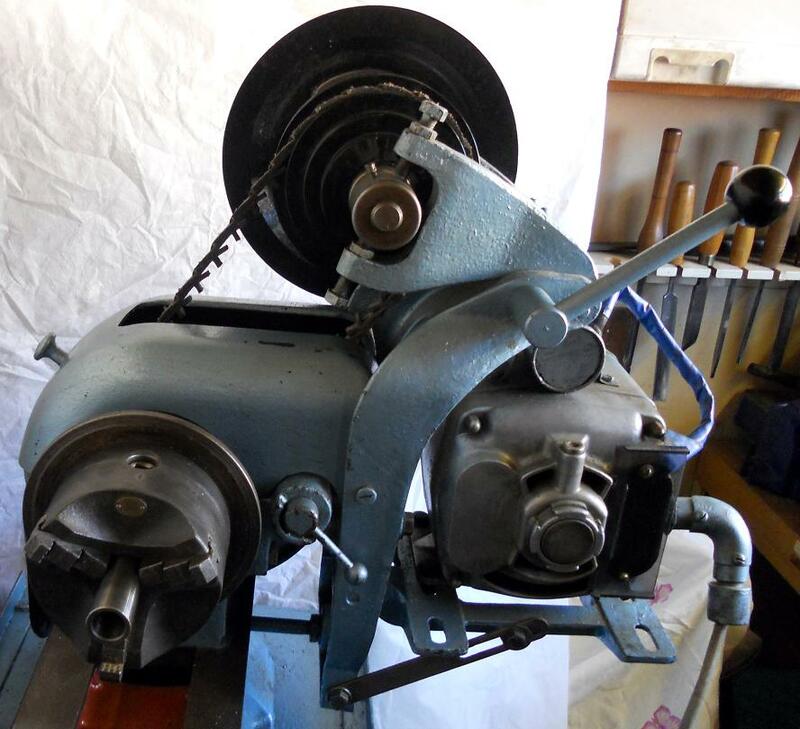 A further puzzle is the reason for commissioning specially-made plastic changewheel guards and countershaft and headstock pulleys when metal originals would have been available cheaply from the USA. There was also a price difference between the Halifax and Atlas machines: for an equal specification with 24-inch between-centres capacity (and including a motor), in 1949 the Atlas was £84 : 10s : 0d and the Halifax £74 :10s : 0d. - a useful saving of some 12%. 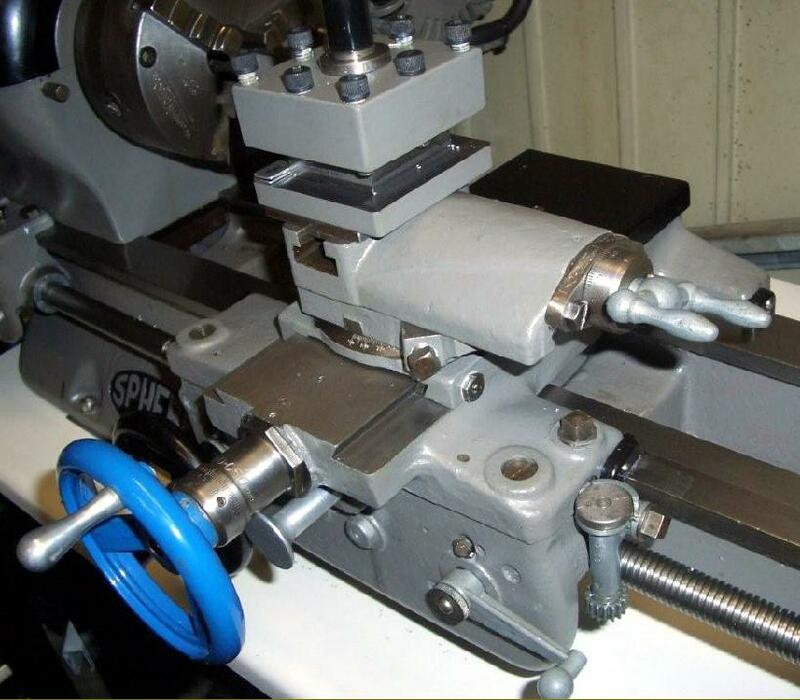 Some, if not all Halifax, Acorntool and Sphere lathes were fitted with a broader and longer cross slide that ran on wider ways, a feature that partially addressed one of the main weakness of the original Atlas design. With so many alterations and specially-constructed parts - including, on some machines, a hexagon nut of the spindle to aid changing spindle-nose fittings and a different, non-interchangeable changewheel bracket - the writer is now certain that these lathes were indeed constructed in the UK - though with some of the otherwise expensive-to-produce ZAMAK components imported. As a point of interest, on the broader cross slide, the wider section of the dovetail was 2.96" across (Atlas about 2.15") and the narrower 2.66" (Atlas 1.83"). 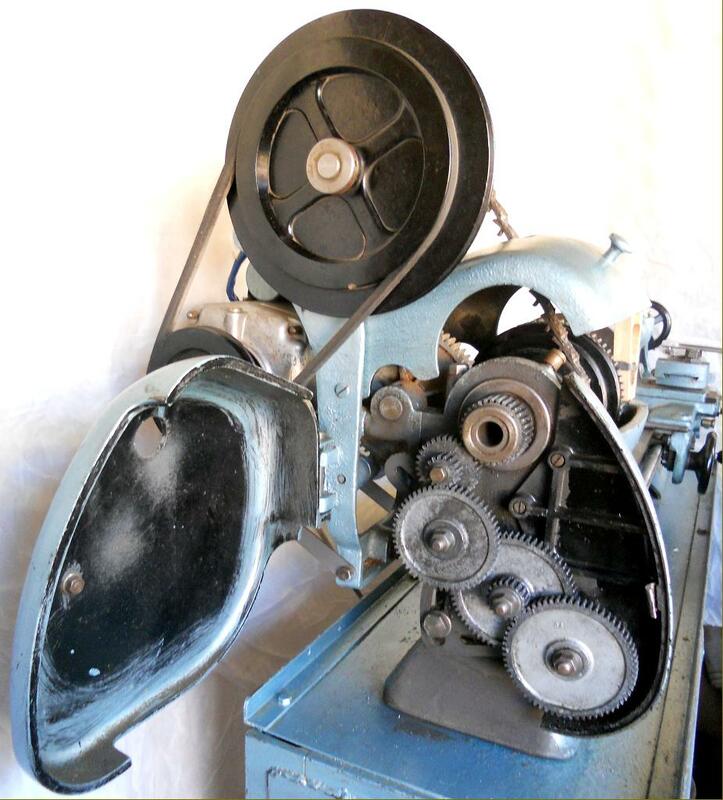 The full width of the wider cross-slide casting was 4.21" - with the result that the circular boss carrying the top-slide swivel degree marks was set completely inside the edges, instead of reaching or even overlapping them as on the original design. Acorn offered a complete range of Atlas, Halifax and Sphere parts and some of the 1955-prices make interesting reading (average weekly earning during 1955 were just short of £11): a bare headstock casting was £7 : 10 : 0d with a spindle, amazingly, at exactly the same price; Timken bearings were £2. : 15 : 0d each and, while the very large "bull" gear on the spindle was £2 : 10 : 0d the smaller bronze gear was £3 : 12 : 6d. For £23 : 5 : 9d. 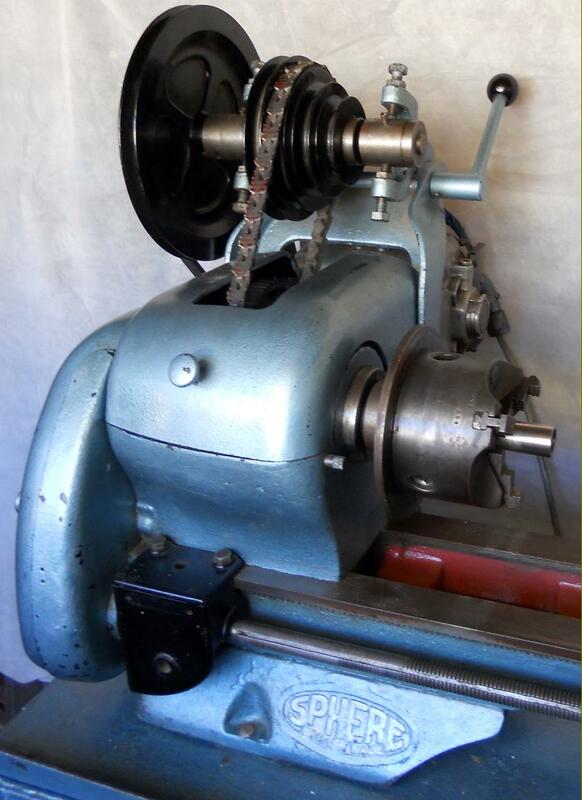 Acorn offered the owners of plain "babbit" bearing Atlas lathes a Timken taper roller bearing conversion kit; this included a new headstock casting, spindle, bearings (and assorted small parts) with the remainder of the items coming from the existing assembly. They also offered a new, fully-machined headstock casting fitted with bronze-bearing for those whose babbit bearings were worn out. Another British-market version of the Atlas, the "Sphere", can be seen here. 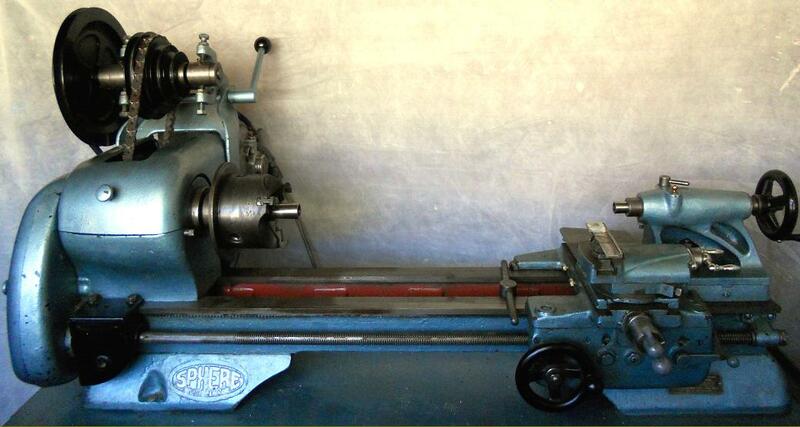 and full details of the original Atlas 10-inch lathes here. The standard handbook for the 10-inch Atlas covers these lathes in every detail. 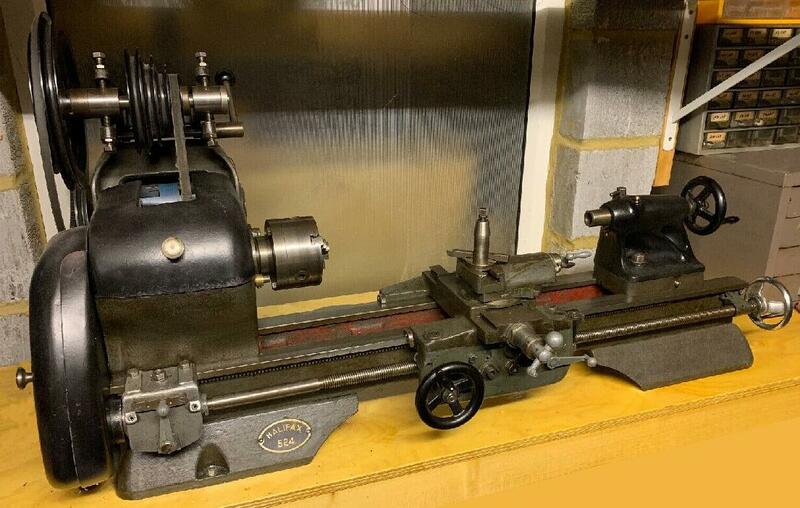 If any reader can supply high-quality pictures of an original Halifax lathe, or has any sales literature, the author would be very interested to hear from them. 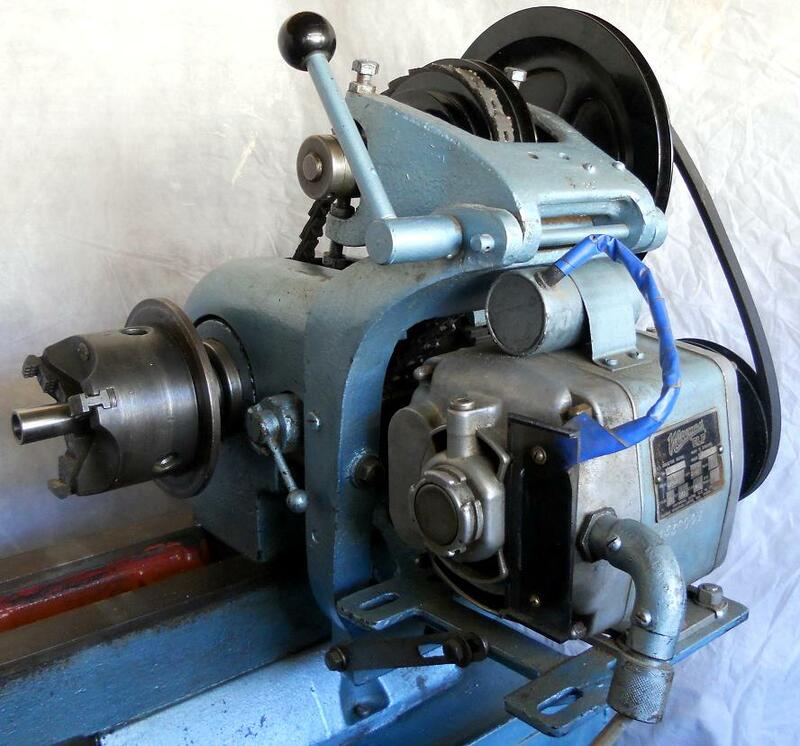 An almost direct mechanical copy of the American Atlas 10-inch lathe the Sphere, like the other English "Halifax" and "Acorntools" clones, had several interesting changes to both the specification and materials used in its construction. It is entirely possible that the whole machine was made in Britain, but also feasible for larger parts such as the bed and headstocks to have been imported - for example, the "Sphere" logo and description "British Made" was cast into the headstock foot, an easily-changed component. However, as the range of changes and modifications were so numerous this would indeed appear to have been a UK product: the cross slide was wider and, on some of the changewheel-equipped models, the casing of the leadscrew reversing gearbox was made in a hard black engineering plastic, a material also used for the changewheel case, the headstock belt covers, the double-step pulley on the countershaft, the two matching 4-step pulleys on countershaft and headstock and, on some lathes, the carriage-traverse handwheel. 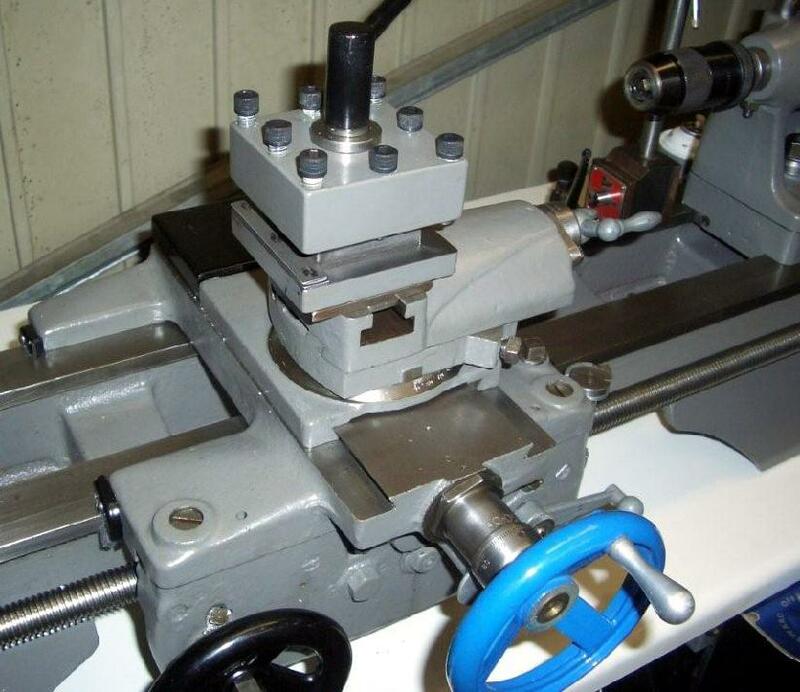 While some Sphere lathes may have been supplied with plain bearings (the Acorntools version certainly was) more than one example has been found with shouldered Timken taper rollers--but instead of being pressed into the headstock housing they were secured using the twin-bolt caps from the plain-bearing model. Another difference was the bullwheel which, although it had the same internal diameter was slightly thinner than the Atlas (0.875" against 1.00"). The Atlas part can be used as a replacement but it's necessary to round off the edges in order to move the bearing lubrication cap. 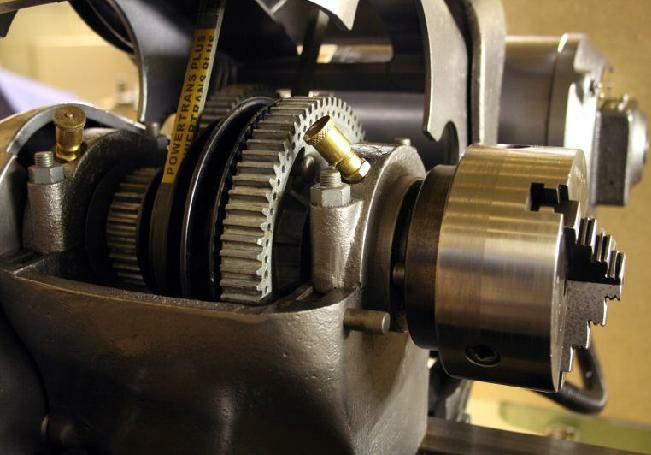 A gearbox-equipped version of the Sphere was also offered, though this, like the Atlas equivalent, is far less common The standard handbook for the Atlas 10-inch lathes covers the Sphere, Halifax and Acorntools models in every detail.. Although it is apparent in this publicity picture that the pulleys are made from plastic the finish of the inner and outer changewheel guards hides the fact that these too are made from the same material. Like the Halifax, the Sphere had an appreciably broader cross slide than the Atlas version with the wider section of the dovetail being 2.96" across (Atlas about 2.15") and the narrower 2.66" (Atlas 1.83"). 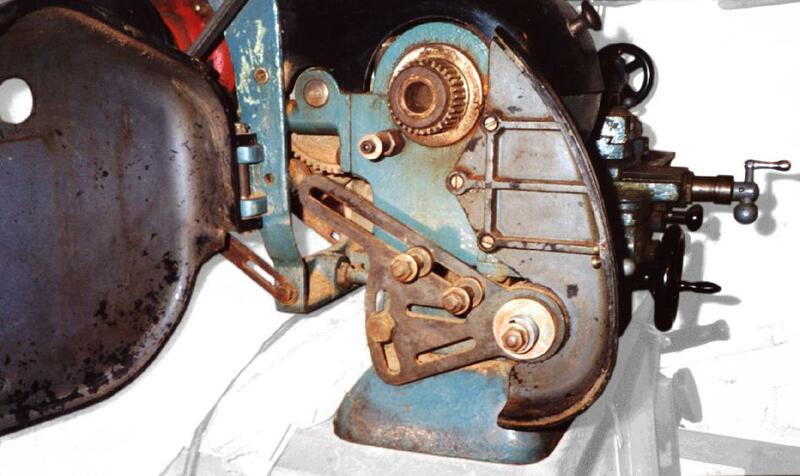 The full width of the Halifax/Sphere cross-slide casting was 4.21"
On some versions of the changewheel-equipped Sphere even the casing of the leadscrew reversing gearbox was made in a hard black plastic, a material also used for the gear-case and headstock covers as well as the double-step pulley on the countershaft and the two matching 4-step pulleys on countershaft and headstock. The "Sphere" logo was cast into the headstock foot - an easily-changed component. 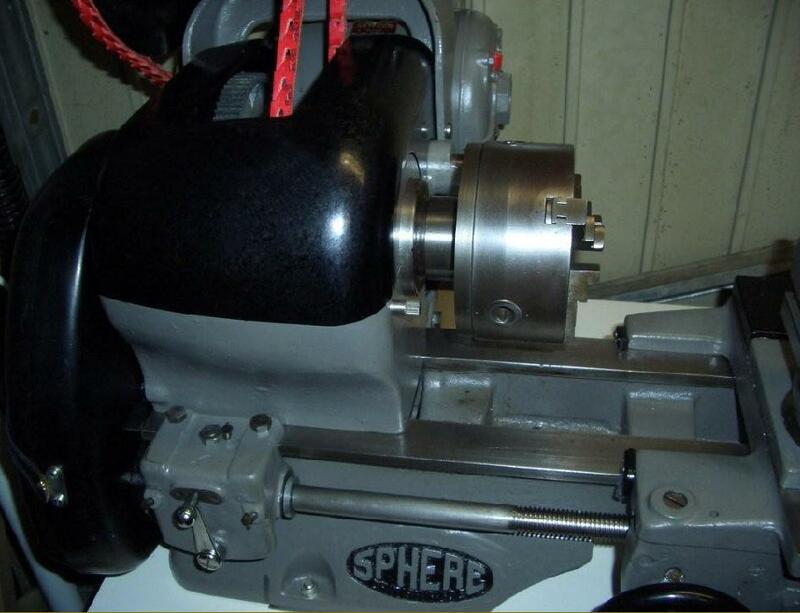 Not all Sphere lathes had the leadscrew reversing gearbox casing in plastic, the one on this model is in metal, yet still different to the original Atlas design. 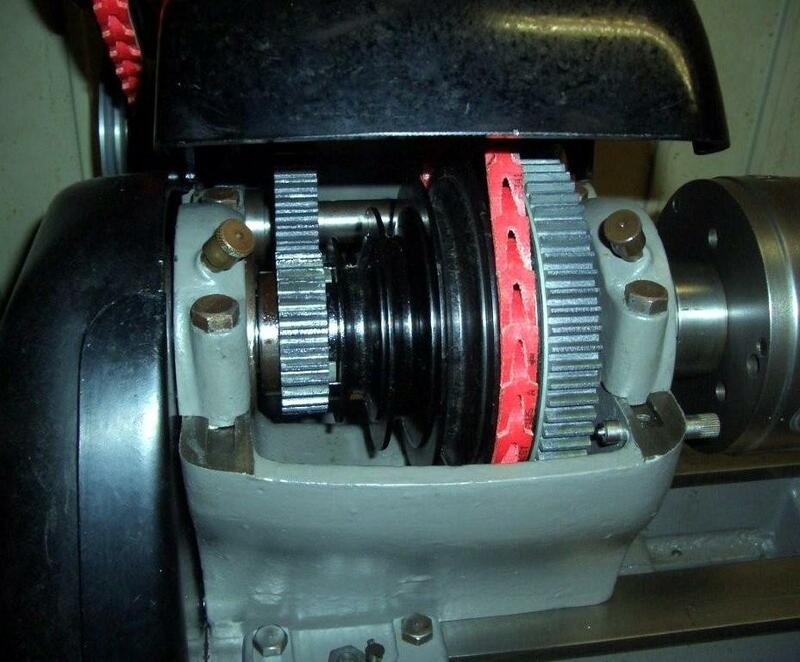 An engineering-grade plastic was used for the changewheel and headstock covers as well as the double-step pulley on the countershaft and the two matching 4-step pulleys on countershaft and headstock. The inner plastic changewheel guard cover was well ribbed on the inside and fastened to the end face of the headstock by three screws. The countershaft was an integral unit, bolted to the back of both bed and headstock. 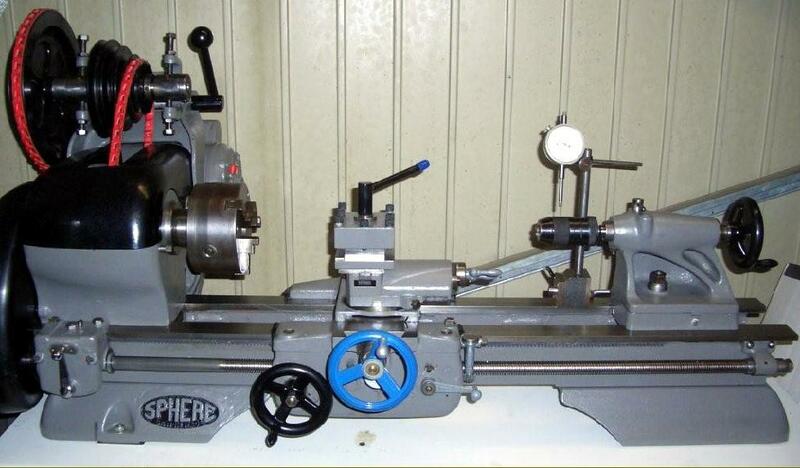 A well-used Sphere of which the owner makes some useful comments - especially regarding the need to level the machine accurately: I found your request for owners of Sphere lathes to contact you on your website. I have owned this one for about 20 years. As you can see it is not quite standard as the screw thread counter has gone as had the original tumbler lead screw reversing gearbox. This had been replaced by a home made one that operates directly on the output from the headstock. That works well but it does compromise the selection change gears that can be easily fitted. The tool post does not look original. It came with the legs for the base but no coolant tray; so I made one out of a stainless steel sidepiece to a urinal (unused). The three lathe mounting feet were not accurately in the same plane; so the bed was twisted when the bolts were tightened. I cured this by careful shimming under the feet. The bed/ legs assembly had insufficient longitudinal stiffness. I cured this by triangulating it. Please see the two inch diameter bar running top left to bottom right. The switch gear is all my own work. Sorry about the cluttered background. 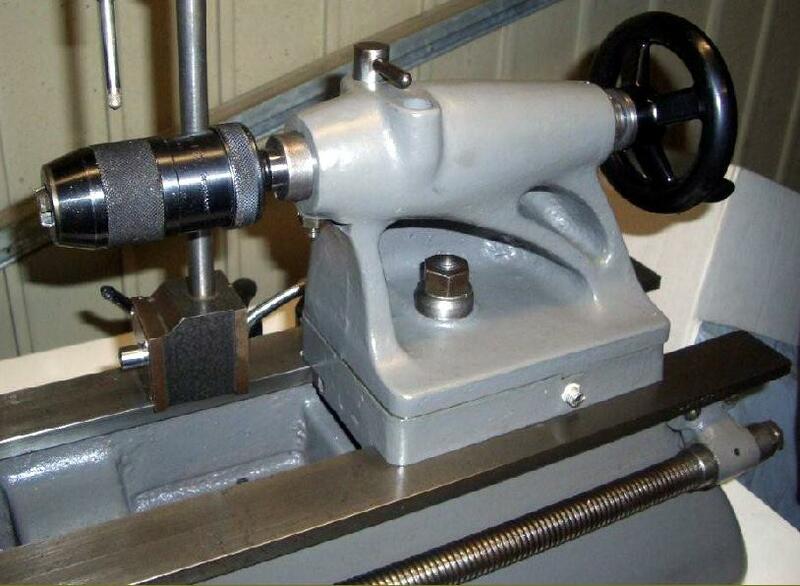 The photo does not flatter the lathe - it looks rather better than that. It still does most of which I want but a milling capability would have been nice. However, one fault is that it doesn't really like parting off.